The Solar Impulse, which has 12,000 solar cells built into its wings, is a prototype for an aircraft intended to fly around the world without fuel in 2012. A solar-powered airplane designed to fly day and night without fuel or emissions successfully made its first test flight above the Swiss countryside on Wednesday. It glided for 87 minutes above western Switzerland at an altitude of 1,200 meters (3,937 feet) with German test pilot Markus Scherdel at the controls. "Everything went as it should," Scherdel told Reuters Television at Payerne military base after landing. It took six years to build the carbon fiber aircraft, which has the wingspan of an Airbus A340 and weighs as much as a mid-size car (1,600 kg). The prototype made a "flea hop" in December 2009, flying a distance of 350 meters one meter above the runway of a military airbase near Zurich. It was then transported to Payerne airfield in the west of Switzerland for its maiden flight. The propeller plane is powered by four electric motors and designed to fly day and night by saving energy from its solar cells in high-performance batteries. It is ultimately expected to attain an average flying speed of 70 km per hour and reach a maximum altitude of 8,500 meters (27,900 feet). Bertrand Piccard, one of the Swiss pilots behind the project, is best known for completing the first non-stop, round-the-world flight in a hot-air balloon in March 1999. 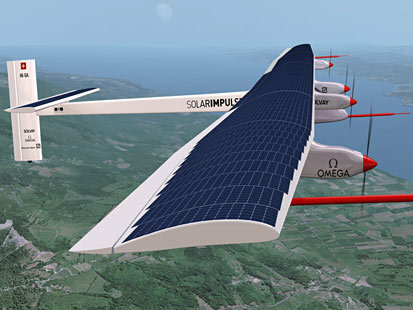 The other main pilot, Swiss engineer Andre Borschberg, has described it as "ten times lighter than the very best glider." "Such a large wingspan for so little weight is something completely new in the world of aviation," he said on the initiative& #39;s website www.solarimpulse.com. The project& #39;s budget is 100 million Swiss francs ($94 million), 80 million francs of which has been secured from sponsors, according to spokeswoman Rachel de Bros.
Belgian chemicals company Solvay, Swiss watchmaker Omega, part of the Swatch group, and German banking giant Deutsche Bank, are the three main sponsors. Ecole Polytechnique Federale de Lausanne (EPFL), one of two Swiss federal polytechnical universities, is scientific advisor.